A Catholic high school in Kentucky remained closed Tuesday morning due to threats provoked by false media reports. During the 46th annual March for Life Friday, students from Covington Catholic High School, many of them wearing "Make America Great Again" hats, came face to face with protesters. One protestor was a Native American with a drum. Others were Black Hebrew Israelites, a religious organization listed by the Southern Poverty Law Center as a "militant" hate group. 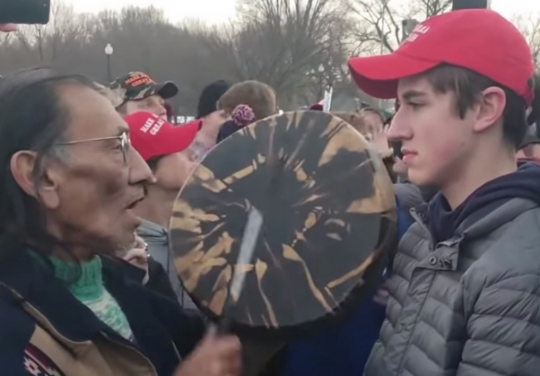 Initial media and activist reports relied on viral video footage and the drummer's account to blame the students for "surrounding" him, falsely claim they chanted "build the wall," and slime them as racist. The New York Times described the students as a "mob" before later modifying the story's title and body to reflect the facts. The initial video received millions of views and tens of thousands of retweets. In a tweet, CNN accused the students of "taunting" the man. The tweet remained up as of Tuesday afternoon. A recent CNN marketing campaign and its banner photograph on Twitter promotes the idea the organization puts "facts first." The initial picture was soon contradicted, but backlash against the Donald Trump-supporting students ensued. The false reporting and the outrage it generated forced local officials to close their school. "After meeting with local authorities, we have made the decision to cancel school and be closed on Tuesday, January 22, in order to ensure the safety of our students, faculty and staff," the school's principal wrote in a letter shared with CBS affiliate WKRC. "All activities on campus will be canceled for the entire day and evening. Students, parents, faculty and staff are not to be on campus for any reason. Please continue to keep the Covington Catholic Community in your prayers." Soon after the initial reports, eyewitness accounts and longer footage became available, which contradicted the conclusions many had drawn about the incident. A full account showed the Native American elder approach the students, who chanted along with the elder. In the video, Black Hebrew Israelites throw slurs at the students, who do not respond in kind. Gradually, media organizations began correcting their false reports. Some did not. As of press time, the New York Times had not deleted its false tweet. Twitter suspended the account of the person whose incomplete video had gone viral, telling CNN Business that "Deliberate attempts to manipulate the public conversation on Twitter by using misleading account information is a violation of the Twitter Rules." Fox News anchor Laura Ingraham reported Tuesday that the students plan to visit the White House and meet with the president in the coming days. This entry was posted in Issues, Politics and tagged March For Life, Media Bias. Bookmark the permalink.